The Witching Herbs Book Review and Giveaway! This one goes out to my more experienced witchy types in the interwebs; how many times have we complained about these 101 books that all say the same thing? How long have you wanted any kind of Craft book that didn't tell you how to cast a circle or what phase of the moon you should do something in? You wanted something more advanced; something that would take you to another level of understanding in any area of your workings, right? Well, have I got a book for you! 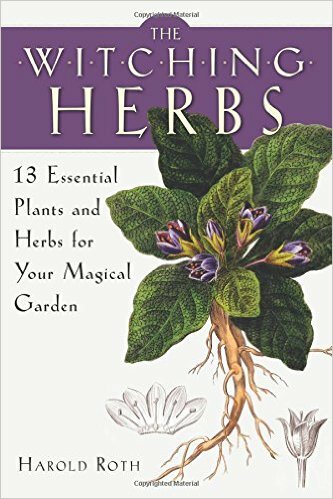 Harold Roth, owner of one of my go-to sites for all things herbal (Alchemy Works), has written The Witching Herbs: 13 Plants for your Magical Garden, and it's just the cure for what's ailed us. Roth writes, “This book is a great choice for intermediate-to-advanced witches who would like to work more closely with the traditional witching herbs, especially the baneful plants with their rather difficult spirits. Working directly with spirits is one of the fundamentals of the Craft," and he's not wrong. This book goes beyond the typical herbal witchery 101. If you are at all a plant whisperer, this guide will enhance your working, and help you understand these beautiful creatures on a much deeper level. "Roth writes simply and clearly on a vast amount of esoteric information that is not easily found elsewhere and will be greeted enthusiastically by those who already have extensive experience and libraries. It is unique in that it combines mysticism with practical instructions for growing each plant, based on Roth’s 30 years of gardening expertise. Each chapter focuses on one plant and includes information on its unique plant spirit familiar, clear how-to instructions for magical projects, and pragmatic information on growing and cultivating." And, there's where he hooked me. It isn't just that he includes the spirit or magical projects, or even the information on how to grow/cultivate these plants. It's that he gives you warnings about them, as well. This is a well-written book on all levels. He's engaging without being frivolous. You know to take what he's sharing with you seriously. I cannot recommend this book highly enough for anyone who wants to take their level of understanding deeper. With that said, I spoke with the Red Wheel Weiser, and they are more than happy to help me offer a giveaway of Harold's wonderful book. The offer is open to the US and Canada. You MUST provide me with a valid email address in order to notify you if you win. You may email it to me privately (kallan.kennedy@gmail.com) along with the user name you used in comments to enter so I can match them up. 2. Go to the Red Wheel Weiser site, peruse their books, and let me know in the comments here which one you might be interested in reading after this one. 3. Tweet about this giveaway. Come back in comments with a link to your tweet. 5. Share this blog post on Facebook or other social media and share the link in comments. For Canadians Only: What is the sum of 2+2? (answer in comments) You will automatically be entered into this giveaway 5 times. Winner will be chosen Sunday, March 19, at 7pm EDT via Random Number generation. Book will be shipped to the winner by the publisher. Good luck to all, and may you thoroughly enjoy this book as much as I have! I follow Alchemy Works on Fb. Harold's seeds are always tops! I would love to win this book to add to my growing collection of herb books. I have been studying herbs now for the last 20 years and I love learning more all the time. Thank you for the chance to win. I am following the Alchemy Works Facebook page. And, I am really interested to also read Arthur Edward Waite's Book of Black Magic. I am interested in the giveaway and am following the Alchemy Works page. Thanks for the review. Looking at the website for Red Wheel Weiser, I'd probably pick 366 Celt for my next book, although they have a lot of good ones! The book I would like is Pipe Francis little book of compassion on red wheel weiser site. I followed Alchemy Works on fb. I browsed the Red Wheel Weiser and decided that "Pagan Prayer Beads" by John Michael Greer and Clare Vaughn would be a great read after this one (since I already make malas). The book Goddess of the North by Lynda Welch looks quite interesting. I'll have to add it to my wish list.